FLEX is a 19,000-square-foot building that can be adapted for various commercial uses. LEVER Architecture developed the design based on an industrial typology that incorporates mass timber structural elements, a distinctive angular frame, and interior mezzanines. The large, 200-by-95-foot open floor plate is divisible into eight 24-foot structural bays, allowing the building to be partitioned for diverse tenants—from a restaurant to small maker spaces. 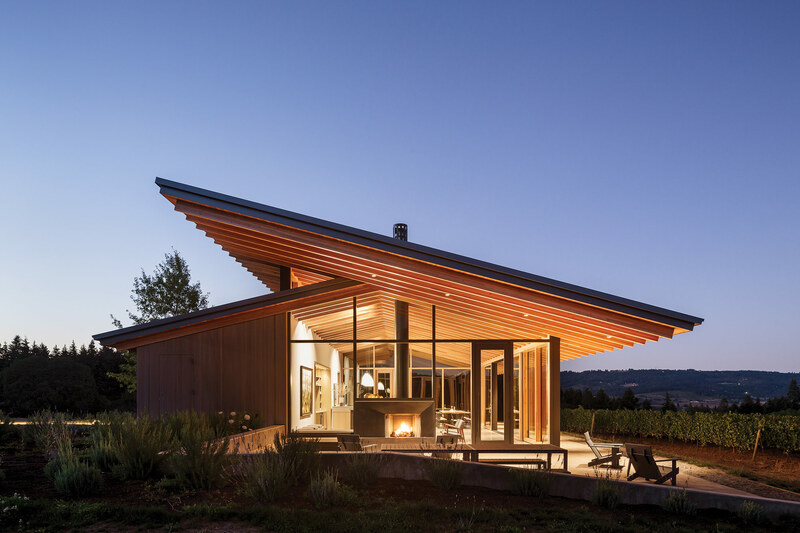 An 80-foot-long triangular clerestory, skylights, and glass garage-style doors bring in daylight. Within a tight budget, the building is constructed in an affordable material palette of plywood, sheet metal, glulam columns and beams, glass, and concrete, with many components available off the shelf or prefabricated off-site. In Portland, Oregon, even the buildings are bespoke and locally-sourced. At least, that’s the case with Lever Architecture’s Albina Yard project, where the developer—Portland-based Reworks—tasked the architects with creating a marquee structure that could be used as a testing site and showroom for emerging mass timber systems built from locally-sourced lumber. Products Sierra Pacific Architectural Wall System; Douglas Fir mullions with a Port Orford Cedar cap. 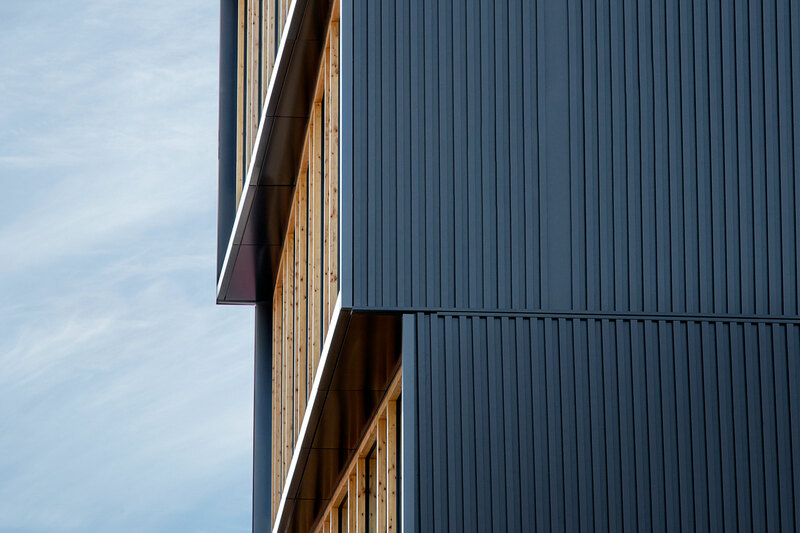 The 16,000-square-foot speculative office building is a love letter to mass timber construction that proudly utilizes prefabricated elements as finishing materials, leaving raw Douglas Fir cross-laminated timber (CLT) panels and glulam beams rough and unadorned. 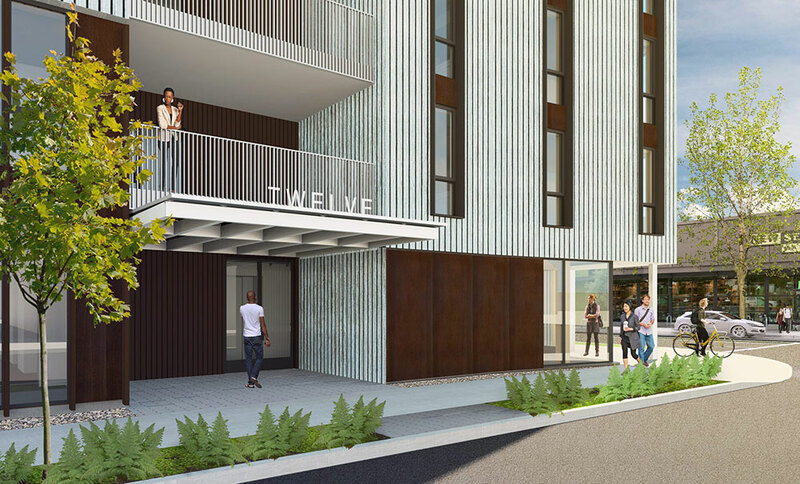 Albina Yard is the first building in the U.S. to use domestically produced CLT panels as the primary structural building element. The speculative nature of the four-story office building forced the designers to be “very, very deliberate about architectural moves,” according to Thomas Robinson, founding principal at Lever Architecture. The mindset resulted in a rather straightforward building: A plywood shear wall–wrapped elevator core anchors the rectangular office block along one of its long sides, leaving open spans elsewhere. Besides the elevator, the core contains bathrooms, egress stairs, and an accent stair made entirely of CLT panels. The building’s U-shaped open plan provides large-span offices topped by glulam beams with columns spaced farther apart than would be allowed under less rigid structural systems. Both short ends of the building are studded with windows—The principal facade contains ground floor retail that hugs the street while the back face overlooks a modest courtyard containing a small shipping container that houses a separate office. Custom-fabricated, powder-coated steel connections hold the wood assemblies together, their engineered bolts embedded deep within the mass of each glulam beam. “We wanted to find a way to embed steel in the wood to protect it from fire,” Robinson explained in reference to the buried bolts. He added, “the powder coat finish prevents the connections from rusting and staining the wood, as well.” Like the structural members, the connections were digitally-fabricated to order for the project and designed to “drift” in either direction by as much as 2% in the event of an earthquake, providing just enough flexibility for the building to sway but not shatter. The crisp structural connections and exposed fire suppression and HVAC systems lend the structure the type of elemental clarity usually reserved for utilitarian warehouse spaces, on-brand for creative office–seeking clientele. 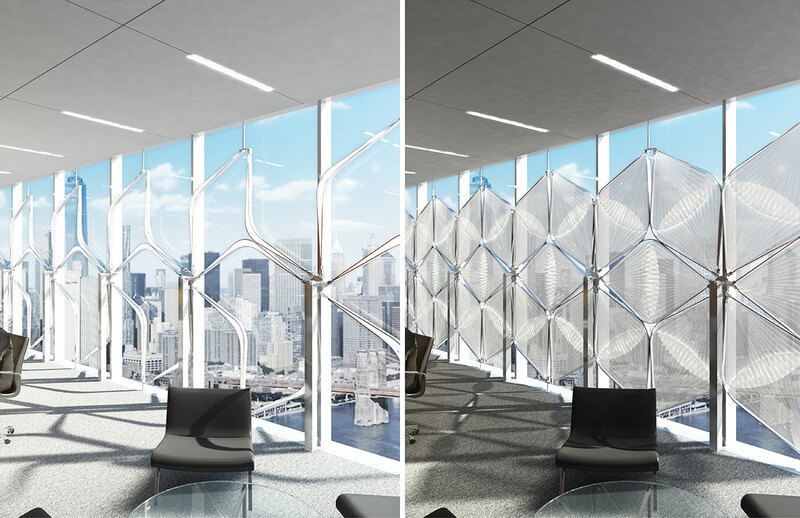 The building’s main facade is clad in a custom window assembly made up of large floor-to-ceiling spans of plate glass interrupted by narrower expanses containing operable windows. 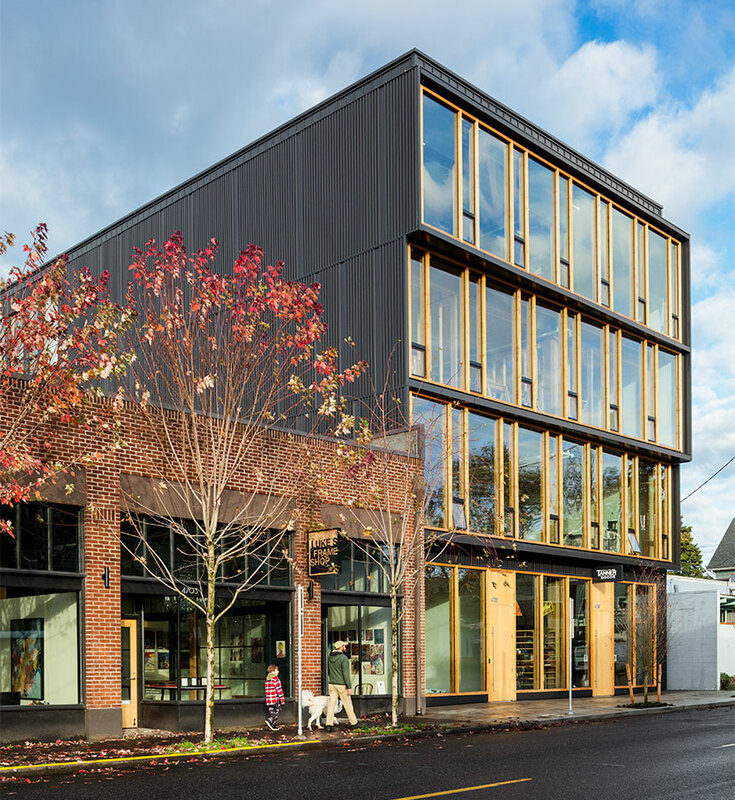 “We were excited to express wood on the exterior of the building,” Robinson said, highlighting the rot-resistant Port Orford Cedar wood mullions and window frames along the gradually cantilevering facade. The window wall is an indication, Robinson said, of the building’s innovative structural system. The face of the building steps out little by little as it climbs, with the second and third floors together projecting four feet out and the fourth floor above cantilevering just a few more feet over the street. The depth of these cantilevers is directly related to the spanning capabilities of the three-ply CLT panels used to structure the building. 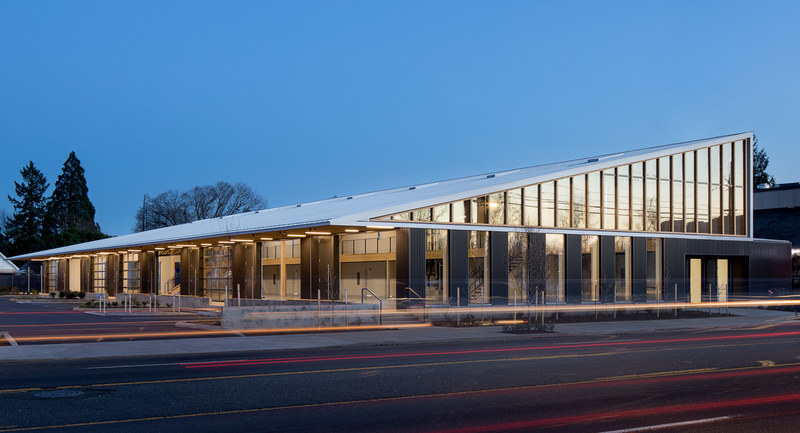 Ultimately, the project—now fully leased—seems to pull off its intended showroom purpose, showcasing glulam beams that were machined in Portland and CLT panels manufactured in southern Oregon, with everything made from Oregon-harvested lumber. 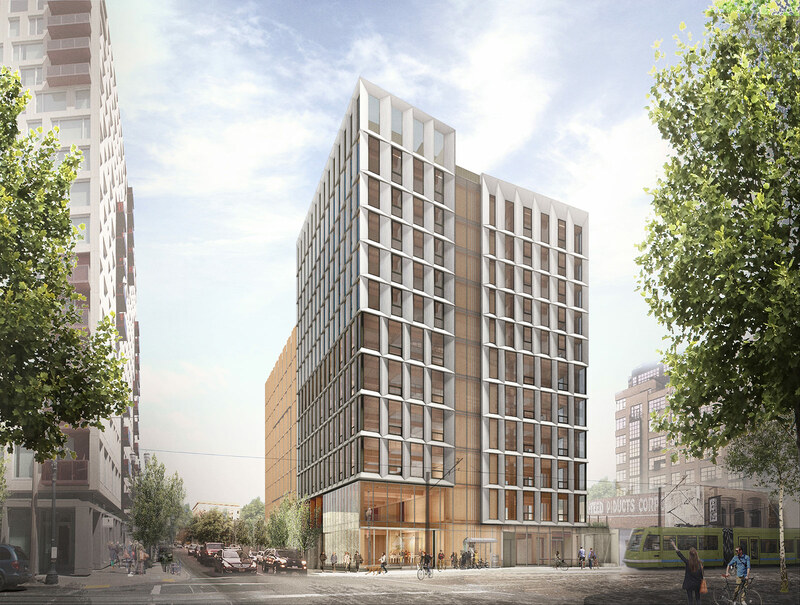 It’s a first for the United States: the State of Oregon and City of Portland have granted a building permit for the first Cross-Laminated Timber (CLT) high rise over 85 feet. 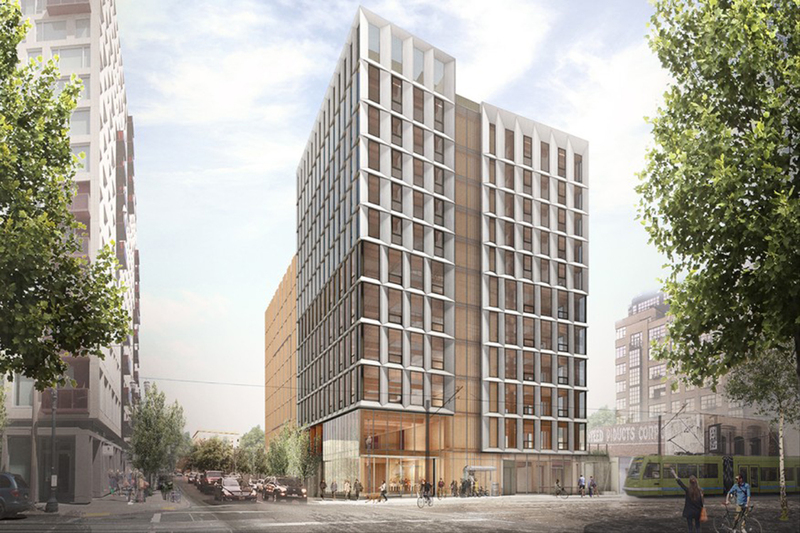 The building is called Framework, an under development 12-story (148 feet tall), 90,000-square-foot mixed-use building in Portland, Oregon designed by LEVER Architecture that will make use of a wood core structure. The building will house a bank and timber exhibit at ground level, offices and affordable housing above, as well as a roof deck and garden. Construction is expected to begin this fall, while the building is slated to open in the winter of 2018. The design required rigorous fire, seismic, and other safety tests to prove its durability compared to typical steel and concrete construction. Testing and research at Portland State University and Oregon State University was funded in part from a $1.5 million U.S. Tall Wood Building award sponsored by the United States Department of Agriculture. While Framework is not the first tall wood building in the U.S.—Michael Green Architecture with DLR Group designed T3, a seven-story mass timber building clad in steel in Minneapolis and completed in November 2016—it is now the tallest permitted mass timber building in the U.S. today.